The European Investment Bank (EIB) is to lend Limerick City and County Council €85m for the development of the city’s 3.7-acre Opera Centre, on a derelict site of Georgian buildings on the city’s Patrick and Rutland Street. 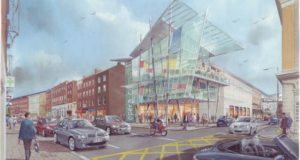 The project is part of the €500m ‘Limerick 2030’ plan, which is set to transform Limerick city centre with new office, commercial, retail, and residential spaces. Limerick Opera Centre is one of four major construction projects under the Limerick 2030 plan. Construction is already underway on the international Gardens Site, a €17m office space project, along with the old Cleeves site, on the River Shannon. Work has also started on the Troy Studios site in Castletroy. The loan from the EIB is believed to be the first of its kind to a Local Authority and the first of a series of supports from the bank to other Irish Local Authorities to fund urban renewal and development. The project is expected to create 3,000 jobs when completed and is a massive boost for the regional construction sector. This project is also receiving the largest EIB support package for urban investment in Ireland to date. Project Opera envisages the creation of a mixed-use development with both public- and private-sector office and some small retail, and it may also include a residential element. A new public square is to be provided as part of the development, with pedestrian links to surrounding city streets. The completed development is projected to accommodate approximately 550,000-sq ft of accommodation, subject to planning. Promoters say the construction of the Opera Centre will be sensitive to the Georgian architecture of the property and will preserve buildings of heritage value, but will see the demolition of others not regarded as having social or historical significance. The Opera Centre loan is seen as a major advantage for Limerick over Cork and Galway in attracting foreign investment.